Lynnderella Lilacs in Love and Heart Strings are two shades that are not part of any of Lynn's collections, and I don't really know if they may or may not be offered in the future. Currently, Llarowe is the exclusive distributor of Lynnderella polishes, so keep up with their Facebook page and sign up for their eMail updates on their site to stay informed of her stock. 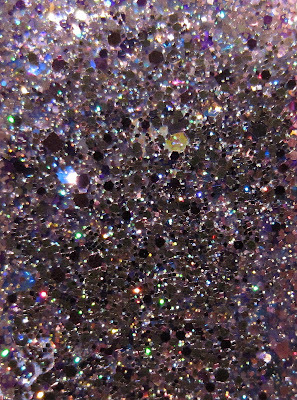 Lilacs in Love, shown here over Misa Sweet Thing (a pale lilac), has a smoky violet tinted base and a multitude of glitter shapes and colors. 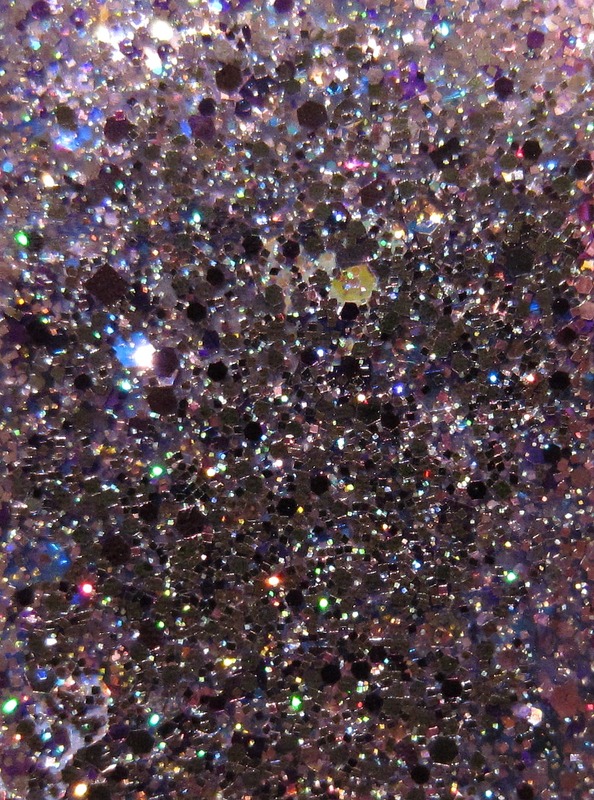 It's almost impossible to determine all of the shapes and colors of glitter in this, but there are larger square and hex bright violet foil shapes, combined with multi colored iridescent micro glitter. I love how the micro glitter seems to glow or light up on the nail when the light catches it. 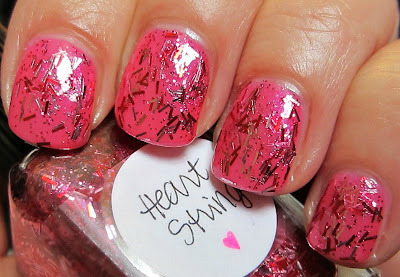 Heart Strings has a reddish/pink tinted base and is filled with red and silvery pink foil bar glitter. 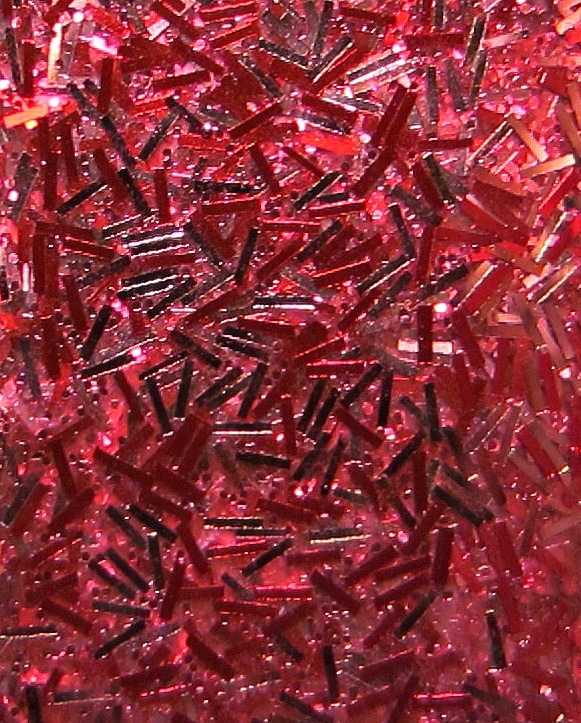 There's also a sparse amount of matching micro glitter mixed in. The photos below show two coats over Misa Bed of Roses, a bubblegum pink creme. I'm going to give this one a go over a black creme the next time I use it, because I think it would contrast nicely with a dark background. 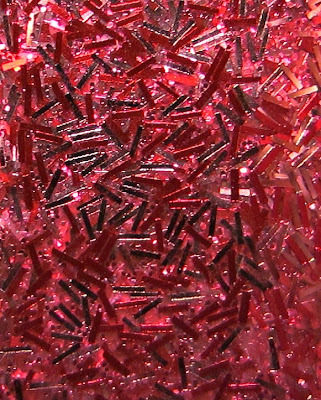 Doesn't this macro shot look like something on a slide under a microscope?!! Is there a Lynderella out there that is not totally fab? I feel for Leah Anne trying to market them and all the geeks that are not able to understand there is a limited supply and Llarowe is a little 'shop.' Sadly of late, I think it's been a little shop of horrors for her. You are lucky to have any Lynerellas. Maybe she should have called it the 'Microbe' collection. Hee hee! These two are awesome. It stands to be said, these are after any glitter-lover's heart. Oh how are you going to tease us with Lynns we can't have!! Boo!! LOL jk, these are awesome! I don't really care for these. both are such beautiful polishes! wow lilacs in love is gorgeous! i wish she would start selling it!